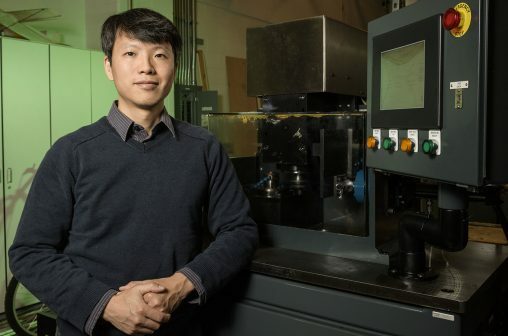 An international organization dedicated to the advancement of tribology and lubrication engineering has honored Sheng Li, associate professor of mechanical and materials engineering at Wright State University. The Society of Tribologists and Lubrication Engineers selected Li and his research teammates to receive the 2018 Wilbur Deutsch Memorial Award for the most outstanding technical paper on the practical aspects of lubrication. This study, titled “Development and Validation of an Automotive Axle Power Loss Model,” was honored for its novelty and value for practical applications. Li’s interdisciplinary research focuses on the interactions between tribology, contact mechanics, fatigue and dynamics, bridging the physical science and practical engineering applications in a state-of-the-art way. One of the goals of his research is to develop physics-based models for the design of more durable and efficient transmission systems in the automotive and aerospace industries. Much of the other research done in this area uses empirical models that result in rough estimates. And some of the models are not very practical for industry because they take unaffordable time to analyze and overwhelming computational efforts. The study came up with novel numerical schemes that enable design analyses to be run in a very short time period. In addition, Li conducted physical experiments with machines to validate the computational model. The outcome of Li’s research is already being incorporated into the design process for automotive transmissions. The research team included Li; Ahmet Kahraman, professor of mechanical and aerospace engineering at The Ohio State University; David Talbot, research assistant professor at Ohio State; and Hai Xu and Avinash Singh of General Motors, which sponsored the study. In another study, Li’s research team looked at turbo engine fans of aircraft that use gear components. The gear surfaces move very fast and generate a significant amount of frictional heat, which can lead to component failure. Li analyzed designs that could minimize high temperatures and improve power and fuel efficiency. Li is a native of China, where he earned a bachelor’s degree in mechanics and mechanical engineering before coming to the United States in 2003. He earned a master’s degree and Ph.D. in mechanical engineering from The Ohio State University in 2009 and continued his research at Ohio State as a postdoc and then a senior researcher. Li joined the faculty at the Wright State College of Engineering and Computer Science in 2013. Besides doing research, he has taught courses in statics, dynamics, engineering lubrication and advanced solid mechanics. The Society of Tribologists and Lubrication Engineers is a professional organization that serves more than 10,000 people and 150 companies and organizations that comprise the tribology and lubrication engineering business sector. It brings together managers, engineers, scientists, technicians, academicians and government institutions from around the world to learn and share best practices for the field of tribology, the study and application of the principles of friction, lubrication and wear. The group’s mission is to foster innovation, improve the performance of equipment and products, conserve resources and protect the environment.